Billionaire Danny Rand (Finn Jones) returns to New York City after being missing for years, trying to reconnect with his past and his family legacy. 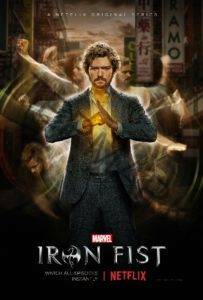 He fights against the criminal element corrupting New York City with his martial arts mastery and ability to summon the awesome power of the fiery Iron Fist.Watch Marvel’s Iron Fist on Netflix. If you like what read about Marvel’s Iron Fist Season 2, please remember to share Netflix New Releases on Facebook, Twitter or wherever you guys want it’s all appreciated.